SPOKANE, Wash. – Fritz Wolff, chairman of The Wolff Company, will discuss “The Dash” at the Gonzaga University School of Business Administration’s Sixth Pigott Entrepreneurship Lecture at 6 p.m., Tuesday, March 21 in the Jepson Center’s Wolff Auditorium. The event is free and open to the public. A reception begins at 5:30 p.m. followed by the lecture, and question-and-answer session. Space is limited; to reserve a seat please visit www.gonzaga.edu/sbalecture. For Wolff, who recently completed a three-year term as chair of the Gonzaga University Board of Trustees, “The Dash” has multiple meanings, which he will share, including the challenges and rewarding opportunities he has enjoyed in his career along with the satisfaction of giving. 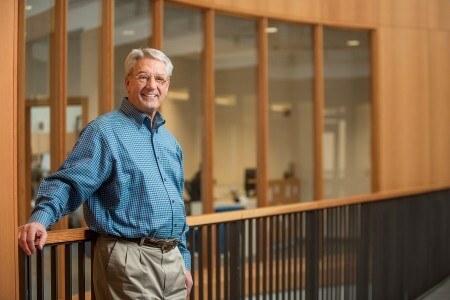 Born and raised in Spokane, Wolff has been active in Gonzaga’s School of Business Administration for 35 years, including as an adjunct professor in both Spokane and Florence, Italy. For many of those years he has served on Gonzaga’s boards of Regents and Trustees. He earned a business degree with a focus on finance from the University of Washington. The Wolff Company is a private equity business that invests approximately $1.5 billion each year acquiring and developing apartment communities primarily in Los Angeles, Orange County, and San Francisco, California; Seattle, Washington; Denver, Colorado; and the Northeast region. He learned the business alongside his father who founded The Wolff Company almost 70 years ago. From Spokane, Fritz grew the company for 40 years. All four of his sons are engaged in the company, which has offices in Boston, Massachusetts; Menlo Park, California; Scottsdale, Arizona; Spokane and Seattle; and Sun Valley, Idaho. The Pigott Lecture is made possible by Gonzaga’s Pigott Professor of Entrepreneurship, a permanent endowment established by the Mark Pigott family, whose legacy of supporting Gonzaga spans nearly five decades. Pigott, executive chairman of PACCAR Inc., is a successful industrialist and philanthropist who recognizes the importance of a comprehensive educational program to develop the next generation of global leaders. For more information or to arrange an interview, please contact A.J. Hawk at (509) 313-7036 or via email at hawka2@gonzaga.edu.